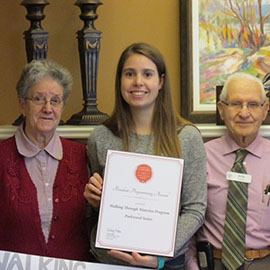 Heather Tunks, a Kinesiology student enrolled in the co-op program at Laurier, helped Parkwood Suites in Waterloo earn a Resident Programming Award through Senior Care Canada this past summer. 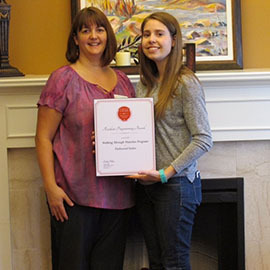 As a recipient of the Menich Family Co-op Work Term Fund, Heather developed and implemented the Walking Through Waterloo program to keep residents active and to foster a sense of community. Residents were encouraged to participate and track the time they spent in physical activities such as walking, swimming, gardening and even seated exercise programs. 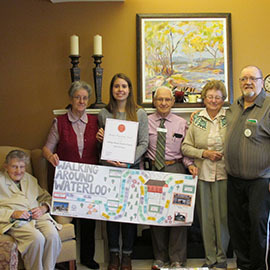 After determining how the time could be translated into kilometres, Heather created a large map of various milestones within the Waterloo Region and made the program more rewarding and cognitively stimulating by notifying residents of the landmarks they reached through cards presented to them at mealtime. Residents were so engaged in the program that the map was expanded to track ‘travel’ all the way from Waterloo to Tobermory!